Jackson, Fleda M, Saran, Ama, Ricks, Sharon, Essien, Joyce, Klein, Kevin, Roberts, Darryl, Worthy,Natasha (2014). Save 100 Babies(c): Engaging Communities for Just and Equitable Birth Outcomes through Photovoice and Appreciative Inquiry. Matern Child Health J. DOI 10.1007/s 10885-014-1436-9. Jackson, Fleda M., Saran, Ama, Johnson, Patricia, Morris, Selma (2013). Qualitative Research in CBPR. In Eds, Daniel Blumenthal, Ralph DiClemente, Ronald Braithwaite, Selina Smith, Communnity-Based Participatory Health Reseach: Issues, Methods, and Translation to Practice. New York: Springer Publishing Company. Jackson, Fleda Mask, Rowley, Diane L. Owens, Tracy Curry. (2012) Contextualized stress, global stress, and depression in well-educated, pregnant African American women. Women's Health Issues, 23(3), May-June, e329-336. Jackson, Fleda Mask (2008). Race, stress, and social support: Addressing the crisis in black infant mortality. Joint Center for Political and Economic Studies. Jackson, Fleda Mask, Hogue, Carol Rowland, Phillips, Mona Taylor. (October 2005) The Development of a Race and Gender-Specific Stress Measure for African American Women: The Jackson, Hogue, Phillips Contextualized Stress Measure. Ethnicity and Disease, 15(4): 594-600. Jackson, Fleda Mask, Arthur, Chris. Klein, Doc, Essien, Joyce, Saran, Report on Appreciative Inquiry, Jackson Roadmap to Heath Equity, University of North Carolina at Chapel Hill, Kellogg Foundation, 2004. Jackson, Fleda Mask (April 2002). Considerations for Community-Based Research with African American Women. American Journal of Public Health, 95: 561-564. Jackson, Fleda Mask, Phillips, Mona Taylor, Hogue, Carol J.R., Curry-Owens, Tracy (June 2001). Examining the Burdens of Gendered Racism: Implications for the Pregnancy Outcomes of College-Educated African American Women. MCH Journal, 5(2): 95-107. Jackson, Fleda Mask. (1995). In The Morning, When I Rise: My Hands in Spiritual Soil. In My Soul is A Witness (Ed) Gloria Wade Gayles. Boston: Beacon Press. Jackson, Fleda Mask. (1989). Educational Experiences of Black Children: The Case of the Black Church. In Teaching and Learning Qualitative Traditions (Ed.). JoBeth Allen. Athens: The University of Georgia Press. Jackson, Fleda Mask. Black Families, Children and Their Church (November 1983). In the Proceedings of the Annual Conference of the National Council for Black Studies, Chicago, Illinois. PBS Television (California Newsreel), Unnatural Causes: Is Inequality Making Us Sick? 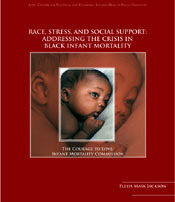 Featured research for episode on black infant mortality When the Bough Break 2008). CNN.com Commentator: “Mother’s Moments-Motherhood from the 1950’s to the present” (May 2007). Focus Magazine (publication of the Joint Centers for Political and Economic Studies) “Addressing the crisis on infant mortality: An examination of race and gender.” (June 2007). PBS Radio, Panelist, National Public Radio, “PowerPoint” Discussion of the health of African American women, March 24, 2002. The Roadmap to Health Equity (Jackson Roadmap Project), Vol. 1, 2005 Sisters’ Voices: A publication of the stress and strain project, Vol. 1, No. 3, Winter/Spring 2002-03. Vol. 1, No. 4, Winter 2002.